Why would you be doing anything on a computer you don't trust? If you just need to send a mail which is not secret, you may send it from a cyber cafe but in order to do so you must enter your password which is definitely secret. A student using a campus computer. Testing a computer you wish to purchase at a store. Testing a computer at a convention. A technician, diagnosing a customer's computer in a lab. A computer in a cyber cafe or ather public access location. This is not for kids. See my reply above. I have a high tech start up we are investigating one touch log in using mobile phone number as authentication....are you pursuing this technology? and if so, is it worth a conversation? Yup, it has been taken down. Because he doesn't have a full-sized keyboard or a 50" display on his phone? Because the phone doesn't support Flash. Because the user wants to download data to the computer. Because the user wants to diagnose or test the computer in some way. Because the computer is on a network that the phone can not access which is either faster or has access to data that the user wants to use in conjunction with his/her Google account. Because the computer has software, data, peripherals, features or capabilities that the phone can not access (Keyboard, mouse, larger screen, fingerprint identification...). Because the phone's battery is near empty, or needs to be reserved. Because the user wants to use the computer and doesn't have a phone, but uses a friend's phone (which he trusts) to access a computer (which he doesn't trust). 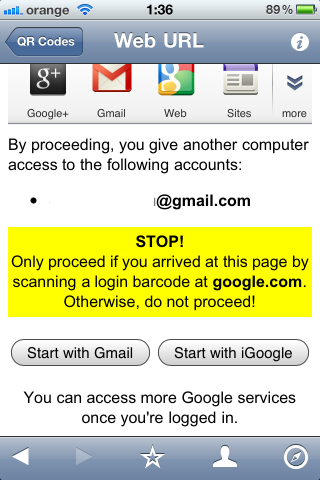 Maybe I will try this service to get more secure in using google services such as gmail.